Vimeo grew its subscriber numbers 9% year-on-year in the fourth quarter to reach 952,000, according to figures broken out by parent company IAC. The video company’s Q4 2018 revenue increased 28% to US$44.2 million, driven by the increase in subscribers and a 22% increase in average revenue per subscriber. However, Vimeo’s operating loss grew 25% to US$10.1 million and its adjusted EBITDA loss widened 32% to US$8.4 million due primarily to higher marketing and legal costs, which were partially offset by higher gross profit margins. In his letter to shareholders, IAC CEO Joey Levin said that Vimeo’s operating losses are measured against the size of the market opportunity and claimed that Vimeo offers a suite of services that would otherwise require a user to piece together multiple solutions at “dramatically higher cost”. Outlining Vimeo’s plans for 2019, he said the company will: add news features at a faster pace than previously; grow subscribers, particularly higher value enterprise customers; and expand its global marketing. 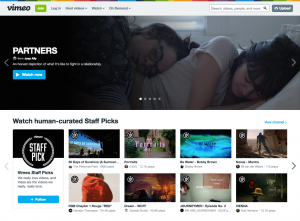 “While Vimeo has high brand awareness in the US, people here and especially abroad aren’t aware of the breadth of tools available on the platform,” said Levin. Vimeo has launched a number of new features since late 2017, including live streaming, HDR support, social distribution tools, and a stock video marketplace.